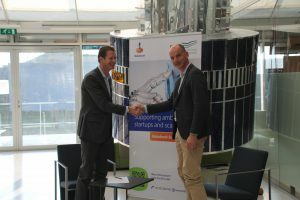 Recently, Rabobank Bollenstreek and SBIC officially extended their incubation partnership by two years. Rabobank director Michiel Kolff considers his bank to be the perfect party for start-ups. A talk about pitches, innovation, and smart loans. Over the past few years, Rabobank Bollenstreek has helped a substantial number of businesses with their finances, Kolff says. But times are changing and the financing products did not optimally match anymore. The Rabobank, traditionally the bank for SMEs, came up with a new product: the subordinated innovation loan. “A product that is perfectly tailored to the starters in SBIC.” It concerns a loan of around € 150,000, which is especially meant for the start-up phase of a business, a phase which is characterised by a lack of turnover and insufficient cashflow. Kolff: “We are the number-one bank for starters, we are the bank that is close by, and we have a social commitment arising from our cooperative ideology. A perfect match with the SBIC community.” According to Kolff, the product is unique in the Netherlands: “An interest-only loan such as this enables entrepreneurs to take a big step in the right direction. We have a national amount of 20 million euros available for such loans.” Click here for more information about the subordinated innovation loan and click here to sign up for the info session on 31 January.